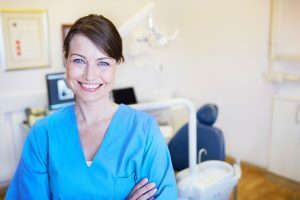 If you are diagnosed with an early stage of gum disease, a few additional dental cleanings and diligent home care may be all that is needed to solve this issue. Removal of tartar under the gumline should be left for a dental professional, and this should be all that is needed, along with good brushing and flossing habits, to cure your gingivitis. That is why it is important to not ignore even the occasional bleeding of gums, one of the first signs of gingivitis. Periodontitis requires deeper cleaning to get at plaque and tartar that have developed under your gumline. This procedure, called dental scaling, will seem like a typical cleaning, except you will be given numbing agents for your comfort. This necessary procedure is designed to prevent further bone loss to maintain support for your teeth. This treatment may be followed by the use of Perio Protect, a dental appliance that works much like a tooth whitening tray to administer medication to your gum pockets. In severe cases of gum disease, laser surgery or oral surgery may be necessary to eliminate large pockets around the teeth and roots created by the bacterial infection.